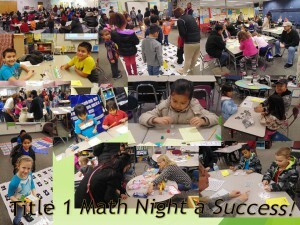 Families at Winchester Village Elementary enthusiastically attended Title I Math Night last Thursday!!! Teachers, students, and family members worked together in four fifteen minute rotations around the school to explore problem solving techniques associated with math. The support of our community was tremendous as we had fabulous attendance and extactically engaged learners! Stations included math with dominoes, shape bingo, tangrams, spoons, top it with addition and multiplication, a scavenger hunt, shape making with play doh, life size board games, odd and even categorization with dice, and skyward instruction. Each family that attended was given a math treat bag with tools to complete the math games at home!